In an instant, your life can change forever. A car swerves into your lane or an animal darts across the road. Maybe somebody does not stop in time or falls asleep at the wheel. A car accident can leave you severely injured or take a loved one from you. Many severe injuries result in permanent mobility impairment. In every case of a severe traffic accident, those involved will be paying the heavy price of loss, whether physical, emotional or property. You may be entitled to compensation that may help you with your burden and restore some of what was lost. Contact Panish Shea & Boyle, LLP for a free consultation with a skilled Orange County car accident attorney. Orange County is located on the southern end of Los Angeles. Freeways are the hotspots for fatal car crashes in this region. In the United States, there are over 2 million car accidents every year and in 2013, there were 32,719 car accident fatalities. Of those, there were 3,104 people killed in vehicle accidents in California and southern California is home to some of the most congested freeways in the state. Cypress surface streets saw four fatalities in 2011. Orange sees fewer, but motorists should still watch when traveling Villa Park and Chapman. Santa Ana’s fatalities tend to occur along Harbor Boulevard just south of the 22 and surrounding areas. Like Orange, Irvine sees fewer fatalities. Huntington Beach has a couple fatalities per year around southern Magnolia and Brookhurst. Newport and Dana Point have few fatalities. It’s important to remember that not all car accidents involve just vehicles. In 2014, California had the country’s highest rate of pedestrian fatalities in the country. Distracted driving, drunk driving, or reckless driving can gave a devastating impact on nearby pedestrians, especially on crowded city streets. We can probably think of a handful of reasons people get in car accidents, but knowing the most frequent causes can help us be mindful of risks and take steps to develop safer habits. The first is distracted driving. Someone is on the phone, eating, looking at a map, or doing all three while shifting, wiping food off their shirt or changing the radio station. Our desire to multitask is life threatening if done at inappropriate times. defects sometimes play a role as well. Other causes include unsafe lane changes, wrong way driving, road rage, potholes, drowsy drivers, unsafe turns, tailgating, driving under the influence of drugs, high winds, tire blowouts, fog, sharp curves in the road, street racing, and loose objects in the car. Being aware of these causes can help us drive more defensively. How Many Motor Vehicle Accidents Happen in Orange County Each Year? Looking back to 2010, there has been a gradual increase in motor vehicle accidents. In 2010 there was 34,779 reported collisions and in 2017 there were a total of 35,053 collisions. This was a total increase of 274 collisions during this time period. The highest numbers of collisions was in 2016, with 36,934 total accidents and 22,902 victims injured. How Many People Died in Vehicle Collisions in Orange County? While Orange County is one of the most popular vacation destinations in the country with beautiful beaches and weather, the influx of visitors and congestion on the roads increases the likelihood of traffic accidents. According to 2015 data from the California Highway Patrol, male drivers are more likely to be in car accidents in Orange County. The only cities where more female than male drivers were in car accidents resulting in injuries in 2015, were Villa Park and Laguna Woods where the difference was one accident. This data shows that most Orange County car accidents occur in Anaheim which makes sense given the fact that it has the highest population of all cities in Orange County. What is interesting is the gender break down of car accident drivers. The data shows that male drivers are involved in injury causing car accidents in Anaheim at a rate of nearly double that of women, even though the general population in Anaheim has slightly more females than males. 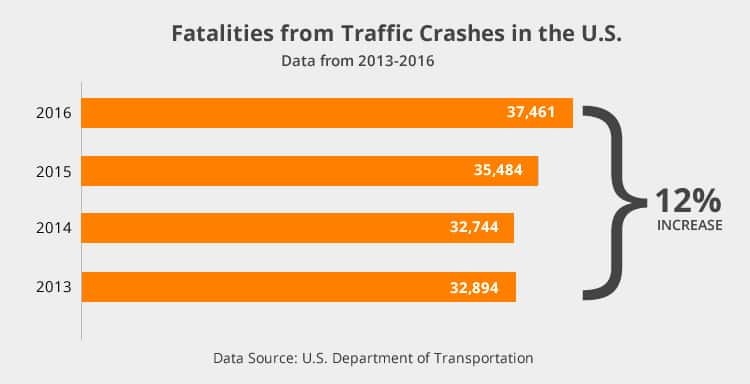 Looking at the data from the U.S. Department of Transportation, you’ll see that there has been a increase in the total traffic fatalities in the U.S. in the last several years. In 2016 the total was up to 37,461 and this includes the deaths in Orange County and throughout CA as well. When Should I Call an Orange County Car Accident Lawyer? If you have sustained significant loss, you have a chance of gaining compensation through a lawsuit. Though you can often file a lawsuit yourself, professional attorneys not only have the necessary research into the legal system but also have the experience winning cases. Your life may have changed drastically due to a car crash, and your losses may include medical bills, property loss, and lost income due to disability or other losses. Our Orange County car accident attorneys can help you win much needed compensation to help you get back on your feet. Pursuing a lawsuit may also help protect other drivers from similar losses. The law office of Panish Shea & Boyle wins cases. We have proven experience winning over 150 verdicts for more than $1 million each. A $15 million case involved a teenager who sustained brain damage due to a truck running a red light and hitting his mother’s car. Another settlement won $9 million for a teen who lost both legs when her car hit a broken guardrail. The U.S. News & World Report has ranked our practice as a “Tier 1” firm for Plaintiffs Personal Injury Litigation, which is the highest rank a law firm can receive. This means our legal practice is ranked among the top 12 in the country. Our attorneys provide consultation to other lawyers across the nation. Every type of auto accident case has an opportunity for compensation, even those involving commercial trucks, product defects, vehicle recalls, pedestrian collisions, and poor roadway planning or maintenance. We take leadership roles in national class-action lawsuits and have been nominated repeatedly for professional honors, including Trial Lawyer of the Year. Call our car accident lawyers in Irvine today! (949) 468-5777 or toll-free at 1-877-800-1700 for your free, no obligation legal consultation today.